This is undoubtedly my most popular photo. It has been used on posters, album covers, t-shirts, coffee mugs... not to mention hundreds of websites. So here I give it to you. Taken on Halloween of 2004. 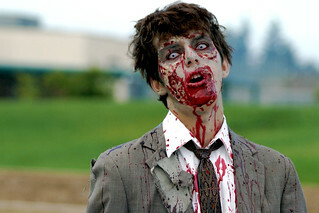 The zombie is my friend Joey Bertran, and his makeup is done by Tera Hardwick. For more information, go to my website.